The Sheep Whisperer: What a Coot! The American Coot, alias "mud hen" or "rice hen", is a unique North American waterfowl that's quite entertaining! The coot is distinctively, the only white-billed bird with a frontal shield, fire red eyes, & a slate coloring in the U.S. 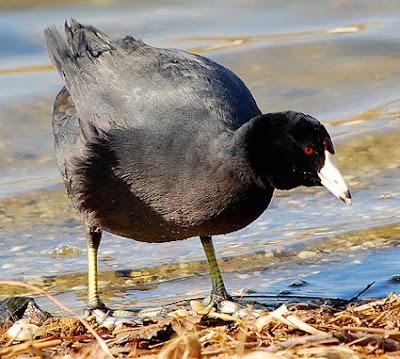 The coot also has feet that are unique, having lobed toes that enable it to step lightly on the drifting vegetation & mud of the marshes it inhabits. Do ewe think I have an anger problem because my eyes are bright red? The Coot is a member of the Rail family & shares its namesake with the informal term for an "eccentric or crotchety" old man! The coot's crazy antics have also given it the distinct title of "Clown of the Pond". American Coots are extremely vocal, using a clucking call that sounds like a chicken & duck combo. 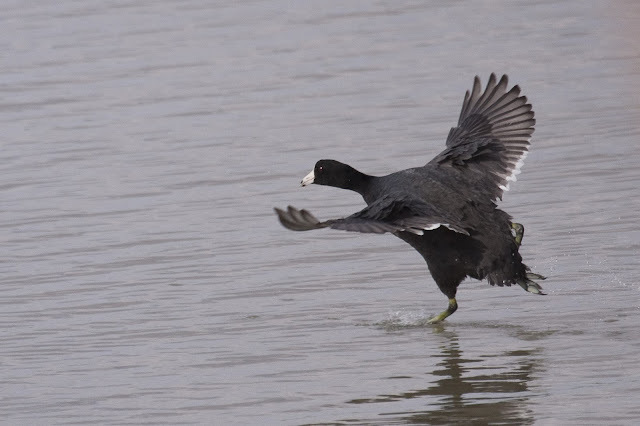 Coots can also literally "walk on water", thus getting a running start into the air! Peter became famous for walking on water, but nobody's asked me for my autograph! During mating season, coots become very territorial, fighting for their mate & holding a tight rein on their boundaries. Any intruders will be met with swift resistance, knowing that this may be the only chance he'll have in securing a female mate! Once victorious,the female will choose to stay or leave.If she stays, she's a mate for life. Do Ewe believe my "Nest Egg" turned out to be a brood of whiny kids! 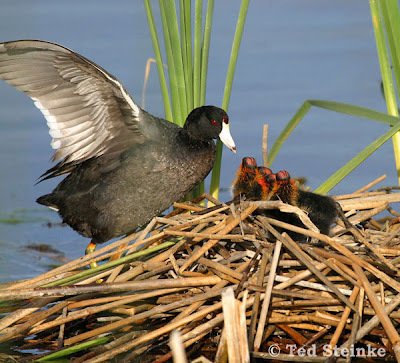 Coots are very involved parents, starting with building their nests.They are meticulous builders, using only dry reeds & brushes to form a mound up to 8 in. above the water.The nest is anchored near the water's edge to prevent drifting.The female then begins laying her 8-12 eggs & the 3-week incubating process commences. The male vigorously protects the nest, ensuring successful births! We learned to swim our first day in the water! Our PARENTS taught us! 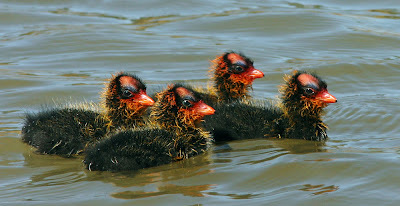 The American Coot, although not mentioned specifically in the Bible, applies the principle of unity revealed in the Scriptures. When threatened, they all flock together, huddled in one tight band. It proves to be the most effective defense against any dangerous assaults of an enemy, such as a hawk! 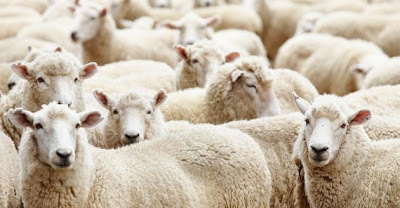 Don't ewe think humans could benefit more from "togetherness"? It really works! Sheep also flock together for safety. Usually quite defenseless alone, they understand the need to band together for greater protection against a common enemy!The Shepherd assists them by leading them to safe pastures, however, they instinctively flock together for the common good. Ewe either," Hang together, or ewe'll hang separately"! Today , as Ewe face Ewe-r day, look to the Good Shepherd to give Ewe unity of heart. mind, & spirit! Together, Ewe can face anything!